Three years ago, Chyusa came to preschool at the original Bright School. He had a learning disability, but there is no system in Rwanda to refer children with special needs. When Bright School moved into a bigger building far from Chyusa’s home, he was enrolled in another school. He hated it and begged to come back to Bright. Chyusa spent most of his days in silence, spinning baskets on the floor. Carol, our expert consultant on children with disabilities, assessed his skills. 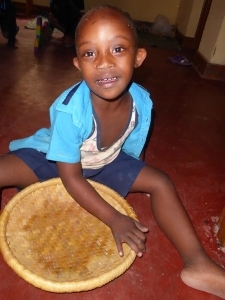 Chyusa was immediately moved from preschool into second grade with his age mates. His transformation is amazing! Chyusa eagerly builds with blocks, writes and illustrates stories, plays restaurant with his friends, and loves to read books! Chyusa recently joined in a Skype call with a middle school in the U.S. He confidently introduced himself, “Hello. My name is Chyusa and I am in P2!” Yes—in English! See how proudly he spoke in this short video. Your donations DO transform the lives of children like Chyusa—and hundreds of other children and teachers in Rwanda who would otherwise languish in schools with up to 100 children in a class, 100% memorization, and no hope for the future.